A Sunday is more precious for us Ashramites… Some new adventures will await us. This Sunday, 21st November 2010, was many things rolled into one: full moon day of Kartika month, Kartika star-day, and Parabrahma day. Amala Bharatam Campaigners’ choice-destination for the weekend was the Oachira Parabrahma temple where a ten-day festival is on. Soon after morning archana and the inevitable chai, everyone was seen running in the direction of the hospital. Several buses were waiting for us, to drive us along a beautiful sea shore road, through a bridge over the backwaters, in order to reach the festival area. At the main entrance while hundreds of devotees were walking in the direction of the temple, we too in hundreds -in whites mostly- got down the buses with our brooms and bags. While the devotees were heading to the place of worship, we started worship just there. 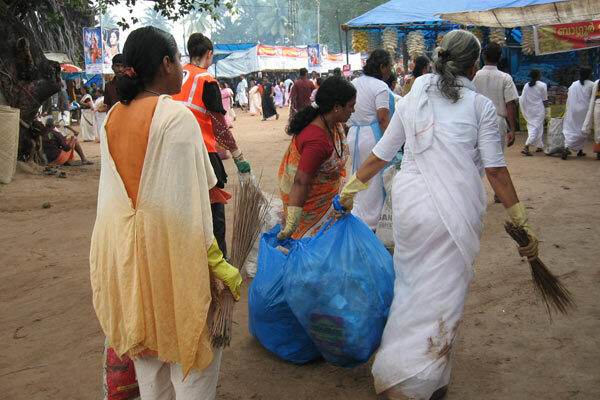 Very informally we began our worship of the all pervading One, started cleaning up the rows of lanes within the temple yard. We were a mixed group of brahmacharinis, western and Indian women, young and old. Several women were in their late 60’s! Last time I wrote about a pile of Brahman remember? This time it was this invisible Parabrahman’s temple yard which was our place of worship. A new pilgrim who comes to this temple, after going through the whole place, would wonder ‘where is the temple, where the shrine?’ This is the specialty of this Parabrahma temple. This is a temple for the Non-Form aspect of Supreme Brahman. No central deity: a highly philosophical concept indeed. Several small shrines for various other deities sprawl all over the place, and no one would call them temples. 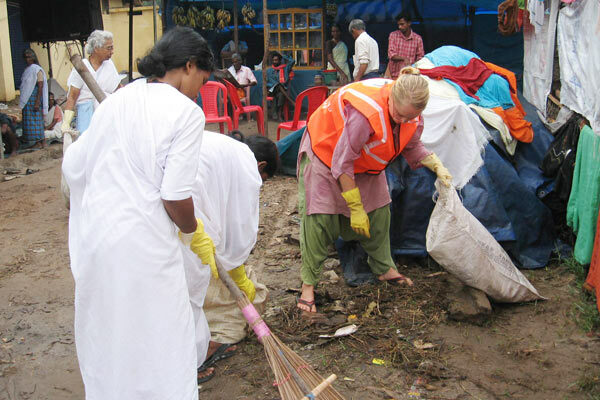 Amma has said several times on the ritual Padapuja, that She would be more happy if Her children cleaned public places. So here was Her birth star day, Kartika and Her children doing just that. 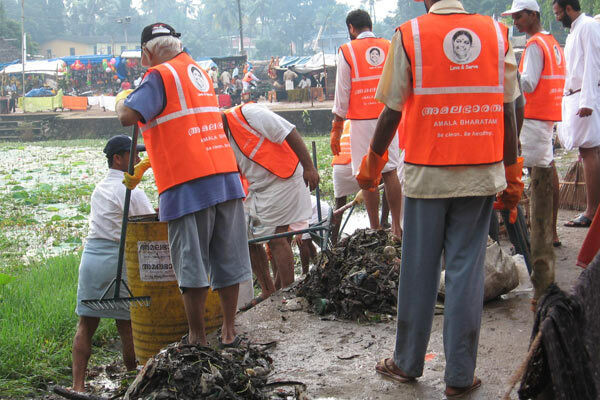 Cleaning of the lake was a very huge job. Mostly men did it. 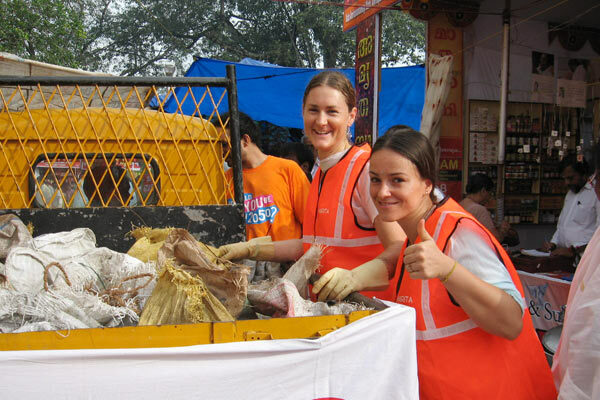 Our garbage collection in bags were promptly brought, then loaded into our goods vans, and deported for sorting. In about two hours we were done with the cleaning. We walked to a temple yard outside this temple where Ashram had sent us breakfast of idly-sambar and chai! 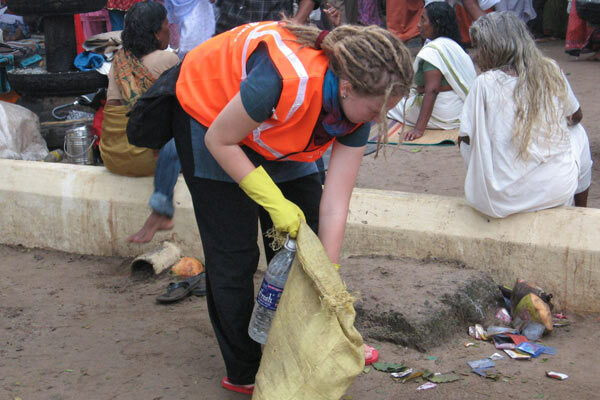 Did it not feel a bit like Amma tours…? Then we got into our buses for a joy ride back home. We were all in a thrill mood, clapping and singing on top of our voices … starting with Amriteshwari Jagadeeshwari surapujite sharam the hit song, little namavalis and also Matarani! By eleven, all of us were back to our routine, yes, with the freshness that cannot be described in words. Hasn’t Amma said ‘When a devotee offers flower to god, it is he who first enjoys its fragrance and beauty.” Similar was our feeling. 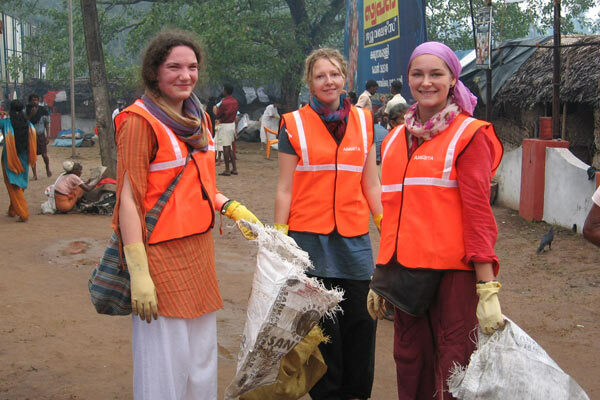 We enjoyed the deed first, the deed of cleaning a public place. It felt as if time didn’t exist those few hours. Where is time or space in the Ultimate!